The comet gold fish is quite similar to the common gold fish but differs in the fact it can grow quite big and its fins are approximately twice the size of common gold fish. Due to this fact they make really good pond fish rather than inside in a small aquarium though they can be kept there successfully as well. Comet Gold Fish Sidebar – Did You Know? 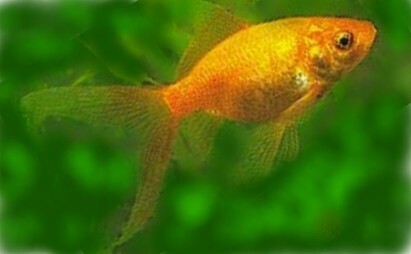 This fish is the only type of gold fish that originated in the United States of America. With long fins, a sleek body and beautiful gold/orange coloration, the comet is an attractive pet for the beginner or the seasoned aquarium keeper alike. And, as mentioned, because it is very hardy and will eat almost anything with little trouble or effect, beginners seem to have more success with these gold fish than most other exotic types. The comet will eat flake food, pellets, and vegetable matter like lettuce, cucumber etc, frozen or live foods and even algae that is growing on the pond wall! This is a good thing if you don’t want to add chemicals into the water to treat the overgrowth of algae. Comets can have variations in their color such as a lighter orange approaching yellow, silvery or even a metallic color. They can also have a mixture of these which give them a "blotched" or "variegated" appearance. I hope this page has been of use to you!